After about twenty minutes (although we found out that we had come a half hour late) the guild president called the meeting to order and they did some guild housekeeping stuff. (Announcements and so on.) But the wheels didn’t stop spinning! If anything this guild is a great time to catch up on spinning projects. Some of the ladies spun the entire time. Once the announcements were over they did Show and Tell, which was enjoyable. Next came a short break, and they did a little raffle thing called “Surprise You.” You can buy raffle tickets at fifty cents apiece (I believe the money goes to the guild) and use them to try to win various things they had set out. This time there was some really good stuff, like an ounce of a Merino/Tencel mix, and a pound of organic cotton, fresh tomatoes (yes, food is allowed for this), and some knitting books. You put the ticket into the cups set next to whatever you want to try to win, and they draw for it after the break. I thought it was a rather nice idea. Whoever wins something is supposed to bring something for the next raffle. Oh, and there was also a lady there who was selling hand-dyed roving. I had to be very strict with myself or I would have bought some. I have to remember to save for the SAFF! After the break a lady gave a little talk about getting started with natural dyes. It wasn’t very in-depth, nor was it a step-by-step how-to guide, but it helped me look at natural dyeing in a new way. The best thing I learned? That you don’t have to pay twenty dollars to order some exotic beetles that will dye a half pound of fiber red. You can use things that grow around you. Acorns will give you a yellow, black walnuts will give you a cinnamony color, or a really dark brown (no kidding! ), pokeberries will give you a pretty fuschia, and cranberries will give you a nice pink. The lady also gave us a printed sheet of instructions with the step-by-step instructions on it, and an easy way to do an indigo pot. A couple tips: If you’re using fresh berries or leaves, you will need equal poundage between the dye stuff and the fiber. If you want to dye a pound of wool, you need a pound of berries or leaves. If you’re using dried dyestuffs, you need very little. I don’t know what the exact ratios are, but this whole process is not very exact! And then this was the fun part. She had brought seven or eight different lengths of roving each dyed in a different natural dye color, and she said we could all take three-inch lengths off of them! 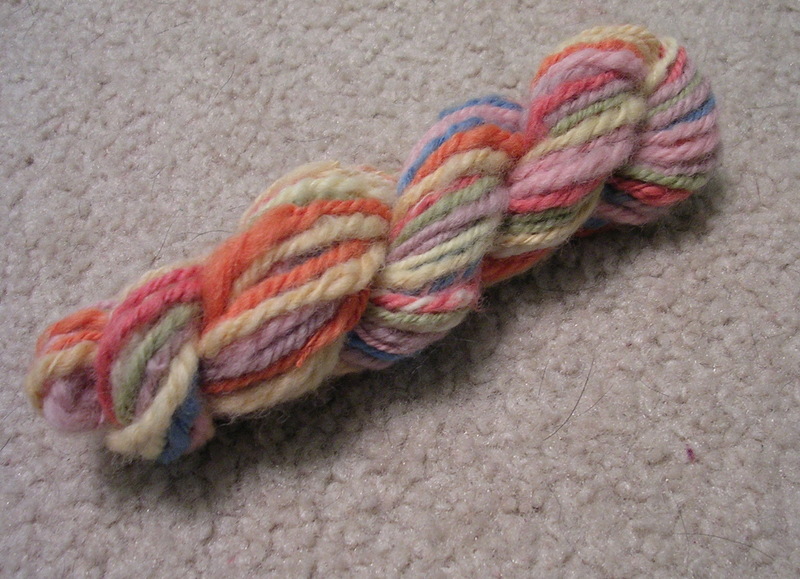 I spun mine up into a rainbow sort of yarn, and here it is. I spun the singles top-whorl, then plied them on a bottom whorl. I can’t remember all the dyestuffs she used, but I do remember—An orangey-red with Brazilwood, some nice yellows and golds with Goldenrod, Sassafrass, Chili Powder, and Mullein, a green with . . . I think it was nettles and spinach. I’m not sure. A great Indigo blue, some pink Cranberry, and something purple. I’m not sure what. I got a little confused after the dust cleared around the free fiber. Apparently the talk was over and the guild meeting had ended. Some people left, some stayed and spun, but nobody stood up and said, “Here’s what we’re going to do now.” It was only four-fifteen, and I’d thought the meeting went until five. Anyway, the lady sitting next to my sister and me showed me how to spin from the fold. I believe the guild costs twenty-five dollars a year to be a member, and I think I shall join. It was a very enjoyable experience, and not too bad of a drive, even though it was long. That sounds like a lot of fun! I have no idea if we have something like that in this area. Thanks for the link . . . sadly the closest one to us is in Dallas, a good two-hour drive away. There is, however, a knitter’s guild chapter that meets just about an hour’s drive away, so that gives me something to think about . . .
Keep in mind that it wasn’t a complete list. I found another guild that meets about an hour north from me that wasn’t listed. There is still hope!